Tired of slow broadband? With a Government subsidy, get 4G broadband set up completely free of charge! Do you live in Wales? Place your Better Broadband Voucher order with us and as standard we'll supply and fit both a high gain external 4G antenna and an internal WiFi modem/router! Read on to find out how the application process works or just give us a call on 03333 447700 and we'll talk through everything with you. Or get more general information on the Better Broadband Voucher Scheme here. First off, you should check to see what broadband speeds are already available from traditional suppliers at your location, either by visiting the Ofcom Broadband Coverage Checker here or BT OpenReach's Broadband Availability Checker here. Put your address details in and either site will inform you of what broadband speeds are currently available at your property's location. Or if you're unsure how to do this, just give us a call on 03333 447700 and we'll be happy to run the checks for you. If either website reports that you cannot access a broadband service running at above 2 Mbps, then you should be entitled to a Better Broadband voucher. If you're told by either website that you already have access to good broadband speeds but you know from personal experience that this information is incorrect, we can still potentially help. Please see the section below titled "Even if you're refused a voucher, we can still help". The BDUK Better Broadband Voucher Scheme now requires that all voucher applications are made by suppliers registered under the scheme on behalf of applicants. All you need do to get the ball rolling is to just give us a call on 03333 447700 and provide some brief contact details (your name, address of the property where you're applying for a voucher, contact phone number and email address etc). We will then submit your Better Broadband Voucher application for you. Or even quicker and easier, just click here and fill in the brief form with those details. We'll get your voucher request made on your behalf as soon as possible. Once we have sent in the request for a voucher on your behalf, BDUK will first check with you via email that have you asked us to do this for you. It is obviously very important for you to confirm this when asked - BDUK will not even start to consider your application until you do so. Moreover, if you do not respond within a maximum of 28 days of your request being submitted by us, BDUK will automatically cancel that request and you'll have to start the process all over again. Upon receiving your confirmation of this, BDUK will run its own extra eligibility checks regarding existing available broadband speeds at your property's location. If these show that your property does meet the subsidy scheme's qualifying criteria, BDUK will then inform both you and us that your application has been successful and that you have been awarded a Better Broadband voucher code. Again, if your voucher application is rejected and you believe this is unfair (because you know from personal experience that the existing broadband speeds where you are are below the 2 Mbps threshold), we can still potentially help out. Please see the section below titled "Even if you're refused a voucher, we can still help". If your application for a Better Broadband Voucher is successful, BDUK will notify both you and us by email. When we receive this notification, we will get in touch with you to discuss which of our wide range of great value 4G monthly plans would best meet your particular broadband needs - you can see these listed at the top of this page. Once you've decided, we will then place your order and arrange a convenient time for installation and start-up of your new 4G broadband service. Once we have got your new 4G broadband service up and running and at least meeting the minimum 10 Mbps performance criteria - and please note, when measured across our entire UK ustomer base, the average 4G broadband performance we deliver is over three times faster than this minimum - we report back to BDUK that your new service is now online. 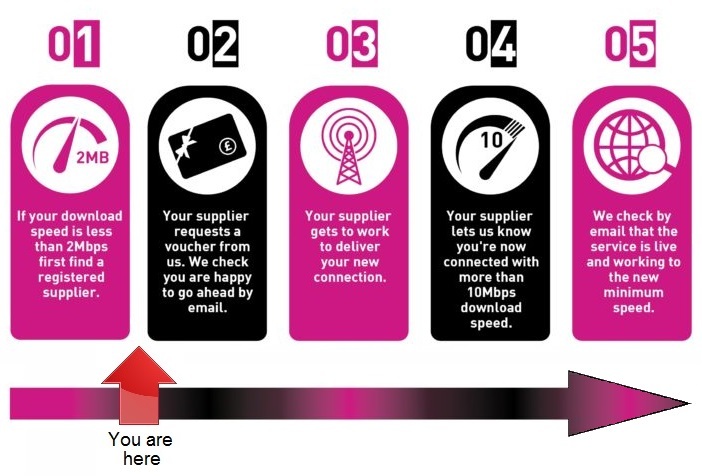 Please note that we are required to get you up and running on your new 4G broadband service within a maximum 28 days from your being granted a voucher code. So it's very important to choose your monthly tariff, get any documentation relating to this signed and returned to us and agree a suitable date for installation all within that period. If for any reason the above steps cannot be completed within BDUK's required 28 day timeframe, we will not be able to carry out installation, set-up and switch-on of your new 4G broadband service, your voucher code will automatically expire and you will have to start the whole process again. Once your new 4G broadband service is up and running, BDUK will again get in touch with you by email to make sure that it is performing to the required specification. It is again very important that you also reply promptly to this BDUK request for information. If you do not reply, your voucher code will be cancelled and you will then be liable for the costs of equipment, installation and account set-up (currently totalling £380.00 inc VAT). And that's it - you'll be up and running on fast, reliable and great value 4G broadband within just a couple of weeks or so... and entirely for free! So, what happens if BDUK refuses your voucher application, even though you know your broadband speeds are terrible? Don't worry - all is not lost! Sometimes the information supplied by Ofcom's and BT OpenReach's systems is not 100% accurate and so these may report that the performance of broadband services currently available to you at your property is actually higher than is the case. There is an appeals process which we will be more than happy to help you with. It usually involves you running speedtests at your property at three different times of the day and sending in screenshots of these as evidence that broadband speeds at your location are below the minimum 2 Mbps threshold. We can talk you through exactly how to do this if you need any help whatsoever. We have helped a number of customers successfully appeal an initial refusal of a Better Broadband Voucher - so if you think you've been wrongly deemed as ineligible, just give us a ring on 03333 447700 and we will do all that we can to get the situation put right. Visit the Government's dedicated Better Broadband Voucher Scheme website. See what the Government has to say about 4G broadband. Discover what real-world customers think of our 4G broadband service - in their own words. An overview on government broadband subsidy schemes currently in operation in the UK. Need any help or advice on the above or ready to get your application made? Call us now on 03333 447700 - we're here to help! © 2017-2018 National Broadband Ltd. All rights reserved. 4G Internet is a division of National Broadband Ltd.